We're reviving our "Latte Drive" this year and making it an annual event! Thanks to your generous support in May/June 2015, we we've been able to keep saving sweet piggies, rabbits and other small furries. So again, we want to ask you to give up one latte a month and send that $5 to us! Texas Rustlers would not be here today without your generous support. It takes all of us to keep this rescue alive and well, so thank you for valuing these little lives and helping us to save them! Can you give up one latte a month to help keep us going strong? Be our hero and sign up for a $5, $10, $20, $30 gift each month - or whatever amount that's comfortable for your family. And this year we have gifts for your contributions! *Valid in store only, from current stock at time of visit. Sorry, shipping is not available for gifts. and make your support go even further. It takes $2271 per month just to "keep the lights on." And even with the generous work our veterinarians do for us and donations of their time, our expenses for vet care are high. In 2015 we spent $10,755.02 on vet care!! We have a goal of $2500 in monthly contributions from friends and supporters like you. If 500 people donate $5 each month, we can meet our goal! Don't like monthly giving? Consider a one time gift in any amount! Click here to make a tax-deductible annual gift today. Have more time than money? Find out how you can volunteer and work directly with the animals in our care. No time or money to spare? Help by sharing our Facebook page to generate new fans and bring us potential forever homes for our furry friends. 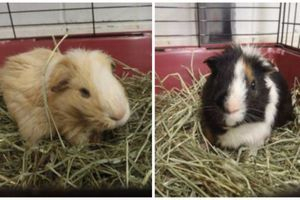 On behalf of all of us and all of the animals here at Texas Rustlers Guinea Pig Rescue, thank you for your continued support!! These sweet, precious boars are Zizzer and Sneetch. Their humans failed them. Badly. The kind people at Fort Worth Animal Care and Control (where they were dumped) saw that they were in trouble and reached out for help. Both boys are severely dehydrated, malnourished, and had weeks (if not months) of poop caked on their feet. They are both suffering from scurvy - an incredibly painful result of vitamin C deficiency. Neither is able to walk properly; the scurvy causes joint swelling and pain forcing them to hop like rabbits if they are able to move at all. Zizzer (the tan and white boar) is in such pain that it hurts him to be held. He also has a respiratory infection and head tilt with facial paralysis from an ear infection. His front feet are swollen two times their normal size. Sneetch (the tri-color boar) has severe dental issues, with overgrown incisors that prevent him from eating properly. He is also infested with lice and has fungal infections. He has already had one seizure in our care, most likely due to pain. They have been to see Dr. Champagne at Carrollton West Pet Hospital, and she is going to help us get them back in shape and out of pain. We are hopeful their damage is not permanent. They are being given subcutaneous fluids, are on pain relievers, and are being hand-fed Critical Care several times a day. They will be recceiving vitamin C supplements, and they have begun treatment for lice. They will also be on antibiotics and antifungals, and Sneetch will require further teeth trimming. Treatment costs are expected to be around $500 including the office visits, medications, fluids, Critical Care, and initial and follow-up dental surgery and/or tooth trimming. You can follow their progress here on GoFundMe. Awesome Activities on November 8!! We're partnering with Panda Express on Saturday, November 8, at their store in Lewisville across from Vista Ridge Mall on Round Grove Rd. Stop by for lunch or an early dinner, show them this flyer (in print or on your smartphone) and help raise money for the piggies, bunnies, and other small furries at our rescue!! 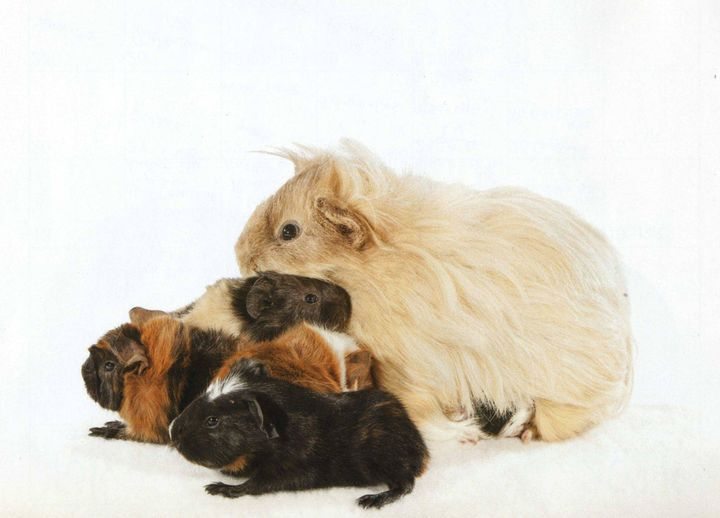 Say hello to our August piggies – mama Fawn and babies Blake, Tiger, Crystal, Taylor and Swan. Fawn was featured in April along with her best friend Jewel. These babies (plus one more who was being shy during the photo shoot) were born to Fawn and Jewel only 10 days after they came to Texas Rustlers. They were all very lucky to have been born into a safe environment where they would never face the challenges their mothers did. Given the proper nutrition and care, the babies grew strong and were adopted into loving homes. Please remember that although baby piggies are downright adorable, we are categorically opposed to breeding. Not only is it dangerous for the mothers and their unborn, but it hurts those piggies sitting in shelters and rescues waiting for a chance at a forever home. Animals of all ages are waiting at rescues – please adopt!!! We can use your old newspapers to line piggy cages. You can drop them off at the Rescue on Saturdays from 9am - 5pm or outside the front door any day it's not raining.